Making an offer that you are not likely to decline, today Playdom has launched the first iPhone mafia game linked to a social network. 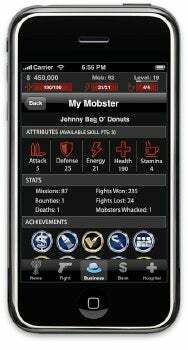 The number one game on Myspace.com, Mobsters, will be busting noses and making friends on the iPhone for $1. Mobsters is a mafia-themed social RPG that already has 13.5 million installs on MySpace. 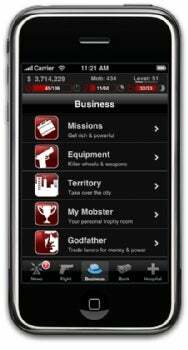 The large community and feature rich game are being completely ported onto the iPhone for Mobsters: Big Apple. That means players who already have the game on MySpace can make bank deposits on MySpace and see the effects on their game on the iPhone—and vice versa. But it won’t be a simple port of a widely successful game. There are several iPhone only features as well. The “Mysterious Mr. X Missions” help players transition from the MySpace game to the iPhone. The story that generates this arc can only be accessed through the iPhone and will reveal a deeper and more complex gaming experience. Janosov also recognizes the unique challenges and advantages of developing for the iPhone. While, it’s relatively easy to invite your friends to join your mob over a social network, the iPhone proves more challenging to network. During some of the later missions, players require large groups of friends to complete the mission successfully. In order to address this problem, Playdom has taken several steps. First, all friends of yours on MySpace who have the game will show up on the iPhone version of the game. Second, certain missions exclusive to the iPhone will get you hired mob members. These will help you complete the “Missions for up to 30 Hired Guns” feature. Playdom has also gone to great lengths to ensure that the playing experience is approachable and fun for new players. “How do we make this a great experience for people experiencing mobsters for the first time?” Janosov asked. With 3.0’s social features, they knew they could take their web property and “optimize it for the iPhone.” The menus, icons, and instructions are recognizable from the MySpace version but are ideally suited and designed for the iPhone. New players will realize that even though they may have played another game on the iPhone that deals with similar themes, nothing will compete with the amount of content provided by Mobsters: Big Apple. Experienced players from MySpace will enjoy making the transition as well. Playdom wanted to make sure that players didn’t have to start from scratch when playing the game, and so all of the players friends, achievements, characters, weapons, etc can be accessed from the iPhone. Players will also be able to switch seamlessly between platforms, as the browser-based version and the iPhone version are both connected. “[We] didn’t want to short change the experienced players who have poured hours into game,” Janosov explained. Experienced players will also appreciate that in addition to the traditional networking methods of obtaining mob members, the iPhone affords opportunities and missions that will provide new ways to get a mob. System requirements call for an iPhone or iPod touch running iPhone OS 2.2.1 or later.